1Des ign In novatio n Grou p, Ope n U niv e rsity, Milton Keynes, UK; 2De partmen t of Desi gn , Open Univers ity , Milton Keynes, UK. Received October 7th, 2010; revised November 3rd, 2010; accepted November 30th, 2010.
buildings an d hea ti ng systems; and more userfri endl y an d i nf or mat ive c o nt rol s.
from space and water heating [2,3]. newables and carbon emission reduction targets [4,5]. 80% by 2050 on 1990 levels . 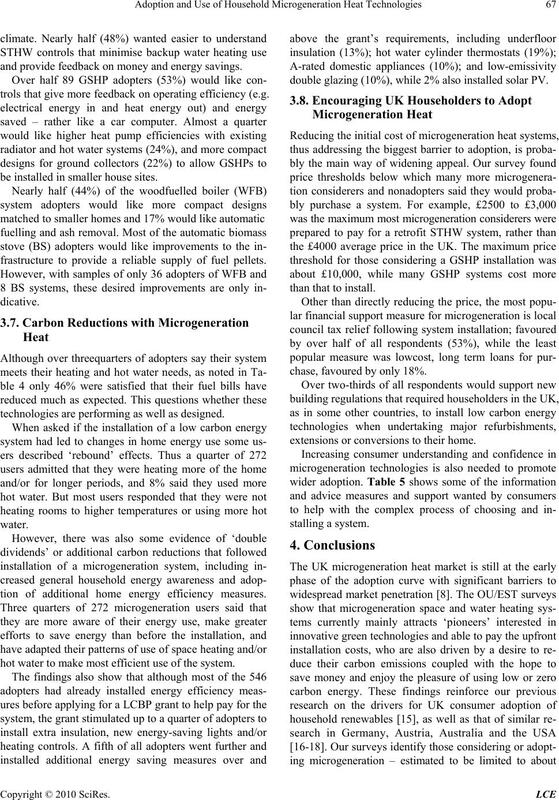 except for low carbon systems such as heat pumps . ings are not guaranteed by their adoption. efficiency or their household energy saving behaviour. provide insight into experiences of using low carbon heat. 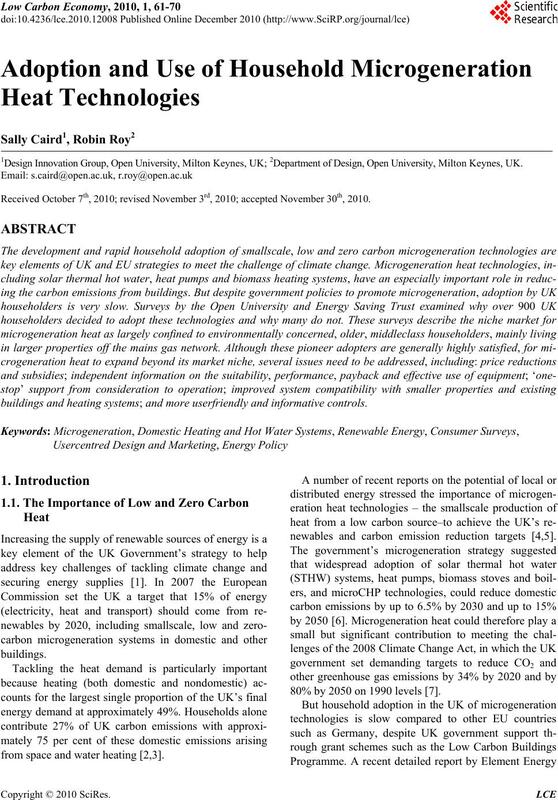 stallation and use of microgeneration heat systems? 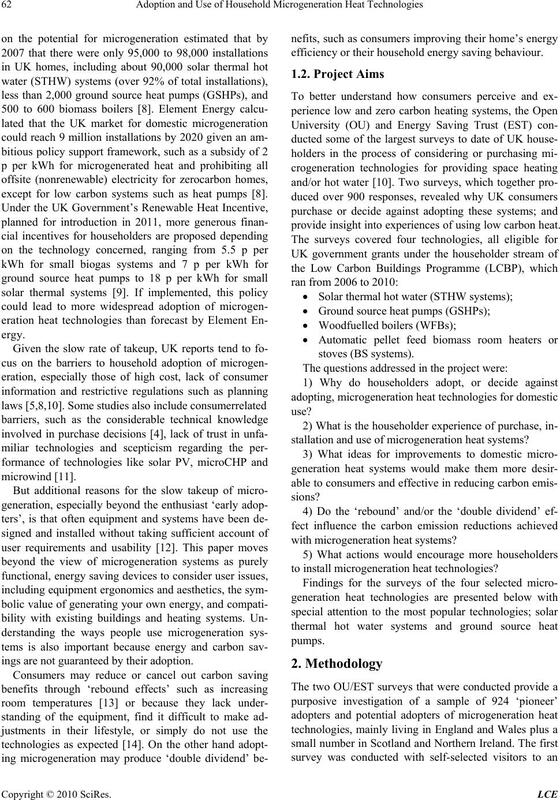 to install microgeneration heat technologies? 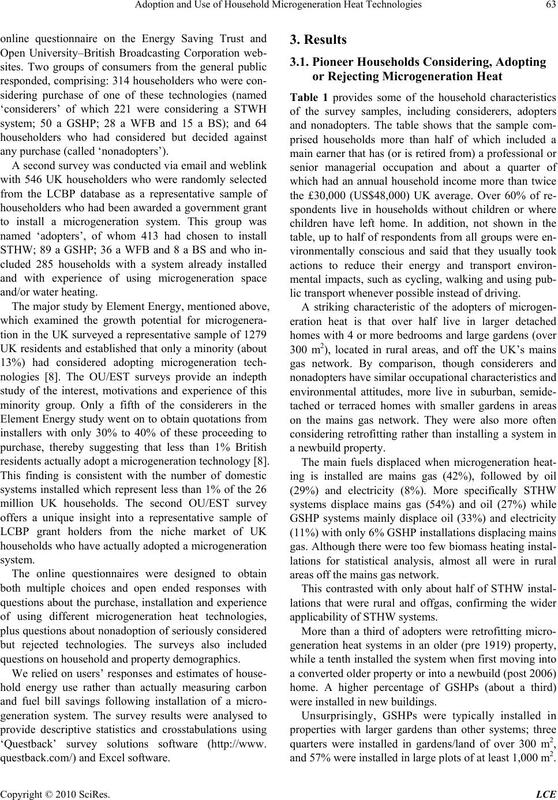 residents actually adopt a microgeneration technology . questions on household and property demographics. ‘Questback’ survey solutions software (http://www. lic transport whenever possible instead of driving. areas off the mai ns g as n et work. were installed in new buildings. and 57% were installed in large plots of at least 1,000 m2. Table 1. 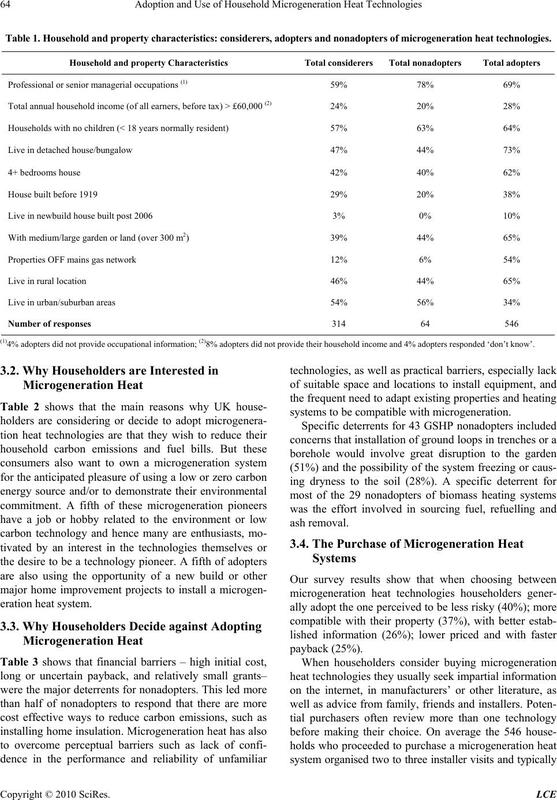 Household and property characterist ics: considerers, ad op ters an d nonadopters of microgeneration heat technologies. (1)4% adopters did not provide occupational information; (2)8% adopters did not provide their household income and 4% adopters responded ‘don’t know’. systems to be compatible with microgeneration. Table 2. 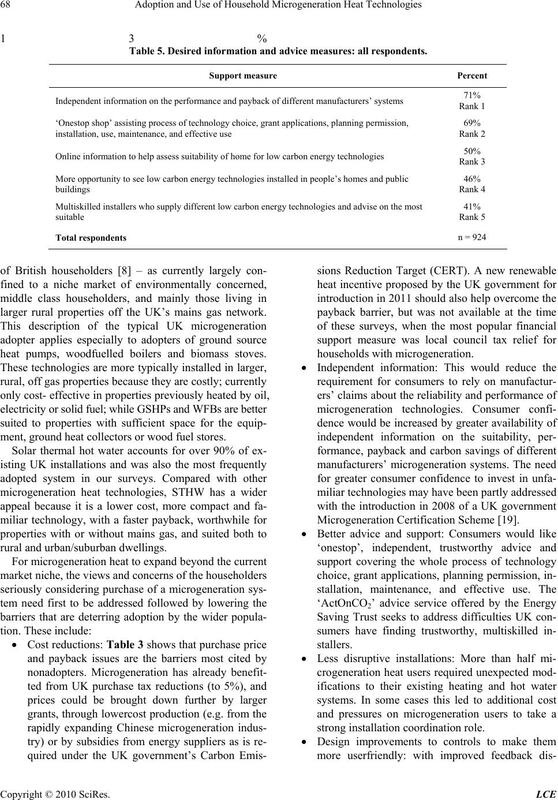 What drives people to seriously consider or adopt microgeneration heat technologies? Table 3. 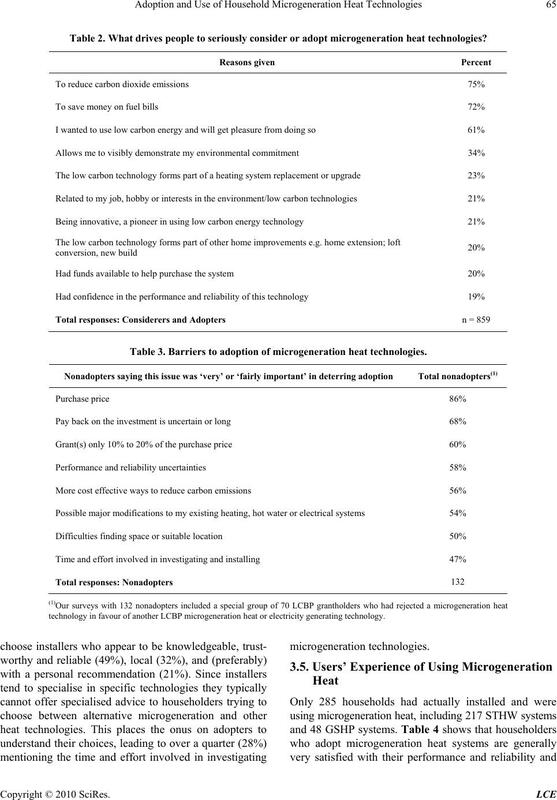 Barriers to adoption of microgeneration heat technologies. technology in favour of another LCBP microgeneration heat or electricity generating technology. Table 4. 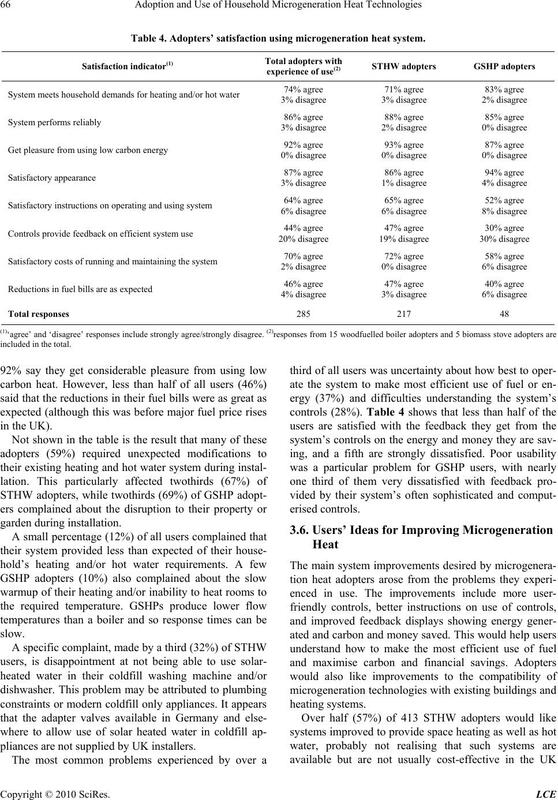 Adopters’ satisfaction using microgeneration heat system. garden during i nstal l a t i on. pliances are not supplied by UK installers. and provide feedback on money and energy savings. trols that give more feedback on operating efficiency (e.g. be installed in smaller house sites. frastructure to provide a reliable supply of fuel pellets. technologies are performing as well as designed. 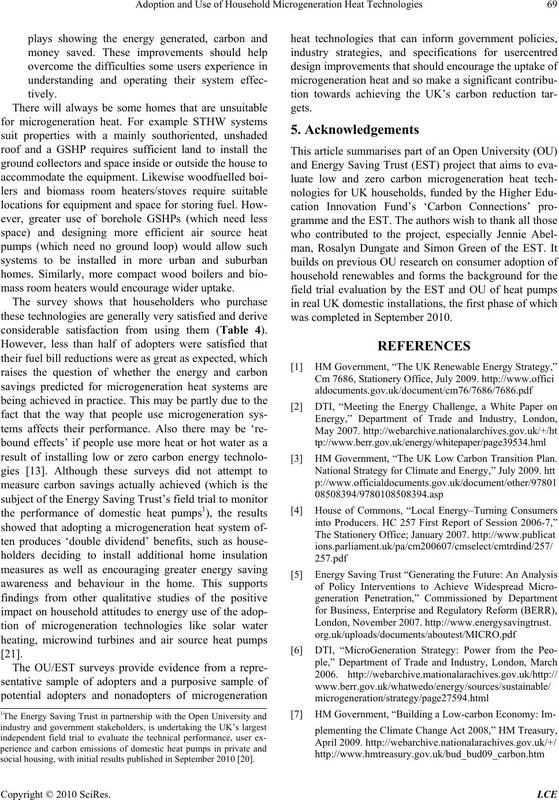 tion of additional home energy efficiency measures. hot water to make most efficient use of the system. double glazing (10%), while 2% also installed solar PV. chase, favoured by on ly 18%. extensions or conv ersions to their home. Table 5. Desired information and advice measures: all respondents. larger rural properties off the UK’s mains gas network. heat pumps, woodfuelled boilers and biomass stoves. ment, ground heat collector s or wood fuel stores. rural and urban/ sub ur ban dwellings. households wi t h microgenerati on. mass room heaters would encourage wider uptake. considerable satisfaction from using them (Table 4). was completed in September 2010. HM Government, “The UK Low Carbon Transition Plan. social housing, with init ial results published in September 2010 . Element Energy, Cambridge, June 2008. http://www.berr. Energy and Climate Change, London, February 2010. R. Roy, S. Caird and J. Abelman, “YIMBY Generation. Energy Policy, Vol. 26, No. 15, 1998, pp. 1105-1112. Open University, Milton Keynes, December 2007. 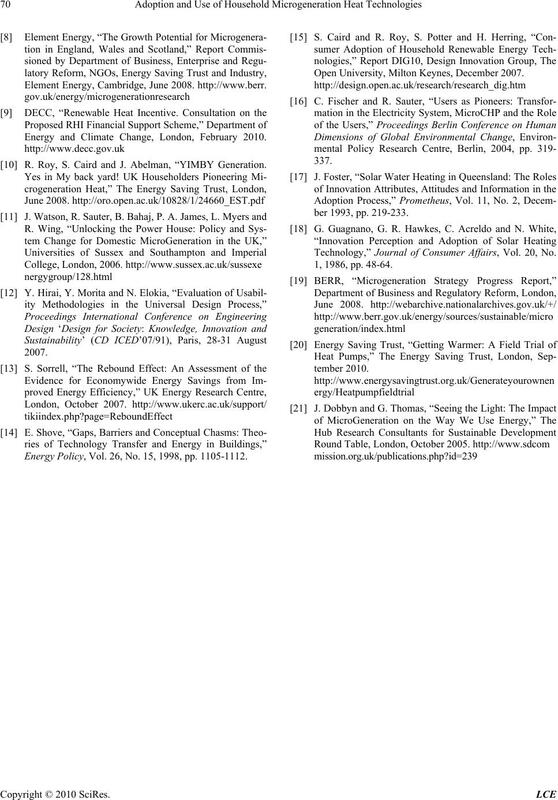 Technology,” Journal of Consumer Affairs, Vol. 20, No.